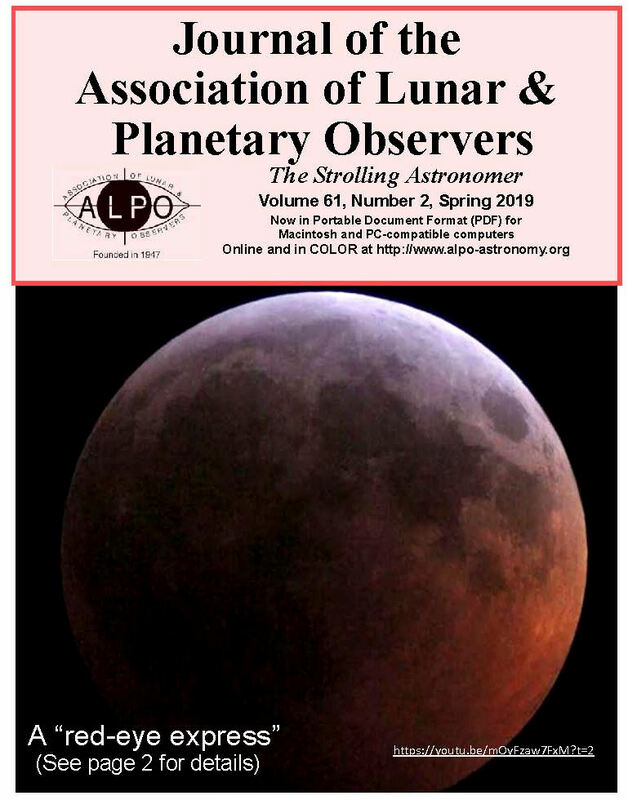 We are pleased (and somewhat relieved) to announce that the entire library of ALPO Journals (subtitled The Strolling Astronomer) through DJALPO-60-4-Autumn-2018 is now available as searchable pdf (portable document format) files online at the ALPO website. Issues for 2019 are available only to dues-paying ALPO members; those issues will be posted to the ALPO website gallery for access to all later this year. Our next project is to complete posting of the indexes to our Journals to the ALPO website. 1. 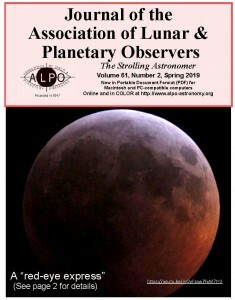 At this screen (alpo-astronomy.org), click on ALPO Section Galleries near the top of the right sidebar. 2. Click on the Publications Section icon, then click on ALPO Journals to open the two-screen library. 3. The Journals are arranged from latest to oldest. To access the second screen, click on the number “2″ near the top left of the first screen. To return to the first screen, click on the number “1″ near the top left of the second screen. 4. To access a particular Journal, click on the folder icon for that volume (or year), for instance “DJALPO Volume 54″ for calendar year 2012. 5. Once inside that folder, simply click on the desired issue then either click on either the left or right blue text prompt as desired. HINT: It is best to download the desired issue to your computer for access at a later time if you do not have a stable Internet connection. All of the Journals may be printed out if so desired and all of the Journals are searchable using Adobe Reader or equivalent; that is, you can use your program’s “Find” tool to locate key words or phrases within that issue. 2. 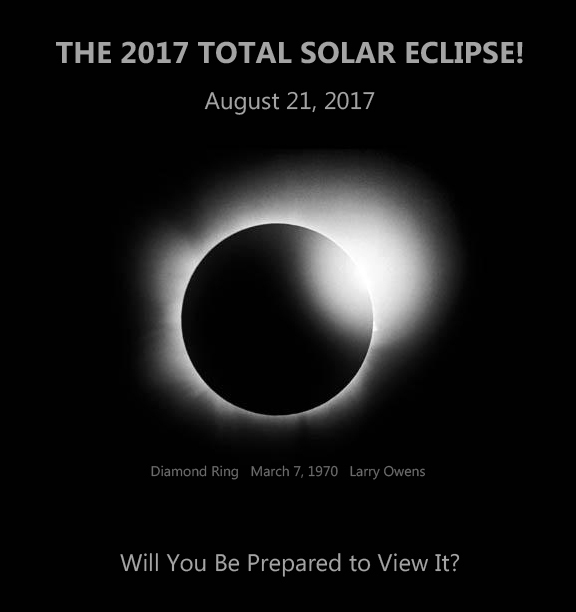 Go to page 1 of that issue and left-click your mouse-pointer on the desired item in the table of contents. Another feature in the later issues allows you to “jump” to outside resources or your own email program by clicking on the blue text hyperlinks. All of our Journals and their contents have been provided to the SAO/NASA Astrophysics Data System (ADS), a Digital Library portal for researchers in Astronomy and Physics and which is operated by the Smithsonian Astrophysical Observatory (SAO) under a NASA grant. Finally, note that references in some ALPO Journals may point to an out-of-date location where ALPO Journals had been located. If you are taken to a “locked” Journal, simply follow the instructions above to reach the free and open version of that Journal on the ALPO website. Because you have the ability to order merchandise from an advertiser with a link on the ALPO website, we want you to know that your privacy is important to us. Click here for the text of our entire privacy statement.